He also challenged the stand of the government that India lacks skills saying it was not true and the authorities have failed to recognise the fact. Rahul Gandhi was addressing the OBC Sammelan today. 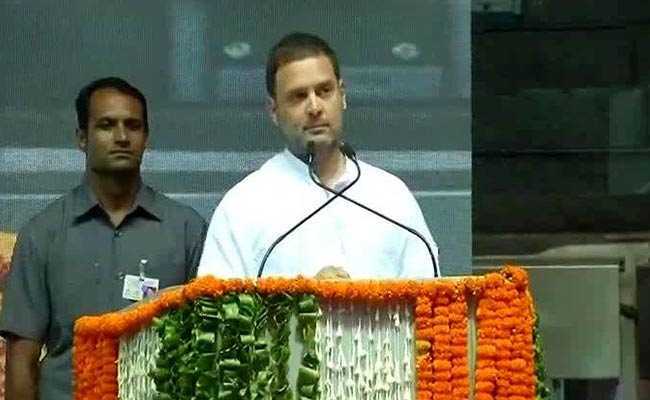 New Delhi: Congress president Rahul Gandhi today attacked Prime Minister Narendra Modi, claiming that his government has ignored the interests of farmers but has helped a small group of industrialists by waiving loans amounting to nearly Rs 2.5 lakh crore. Addressing workers of the party's OBC department in Delhi, he said people who work hard behind the scene are "never benefitted" and the fruits of their toil are enjoyed by others. "People with skills are not rewarded in India ... farmers work hard but you don't see them in the office of Modi ji," he said. Mr Gandhi claimed the non-performing assets of banks have gone up to Rs 1,000 crore. "Rs 2.5 lakh crore were given to 15 industrialists. But the farmer got nothing...the loan waiver was for 15 people but not for the farmer who continues to commit suicide... his children keep crying," Mr Gandhi said.